Natural Omega 6 and 9! 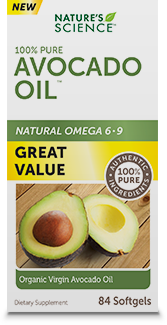 Nature's Science AVOCADO OIL™ is made with Organic Virgin Avocado oil and provides a natural source of omega 6 and 9. Nature's Science AVOCADO OIL contains only organic virgin avocado oil.